One of the most incredible natural phenomena is the Lichtenberg figure, a type of mark left behind after being struck by lightning. 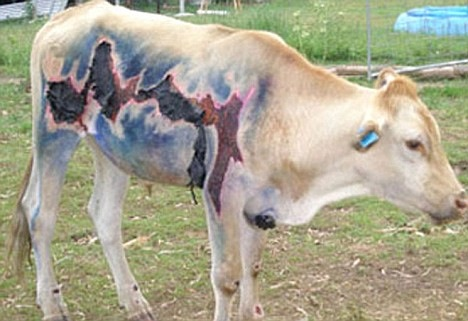 Photos of lightning scars are very unique and almost look as if the bolts from the sky were trying to leave a calling card of sorts for people and animals unlucky enough to be hit. 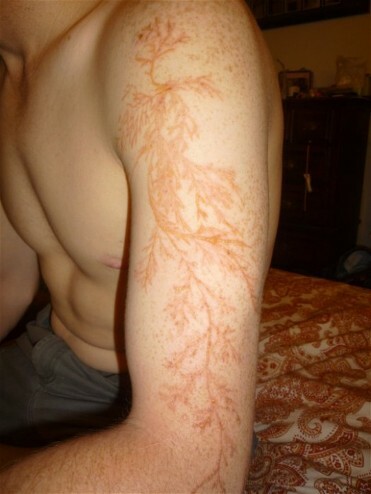 The photos of people who were hit by lightning and survived show a web-like burn on the skin. The figures were observed by a German professor named Georg Lichtenberg in 1777 when electricity passed through insulating materials. Ultimately, the basis of his work led to the discovery of the Xerox machine many years later. The fact that an amazing electrical process is responsible for their scars must be of little comfort to those who have been struck by lighting. Obviously, lightning strikes more than just people. Animals and machines alike are sometimes hit as well, but unfortunately they don't get the same bonus of sharing their stories of survival for the rest of their lives.